I’m pretty sure it is one of the laws of thermodynamics, perhaps the forth. If not it is certainly one of the fundamental attributes of the Universe. And so with the inevitability that accompanies physical laws, here at robives.com towers we have a pile of unpaired socks known to us as the sock orphanage. We currently inelegantly store them in a plastic bag while we wait for the return of the sock siblings. Obviously we “can-nae break the laws of physics” but here’s a possible work-around. Like many bibliophile families, we have a lot of used Amazon packages ready for reuse. Time to press them into service. 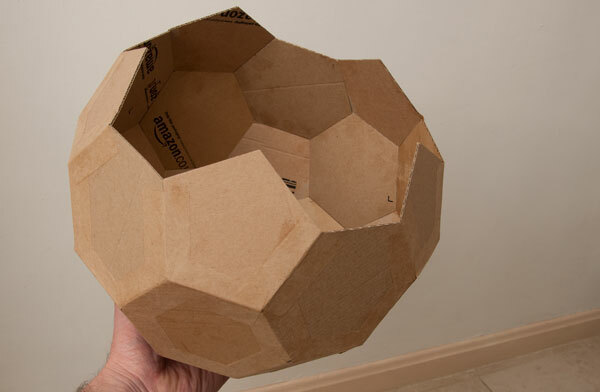 I decided to make a nearly spherical store pod thing, the actual shape I used is a truncated icosahedron, the same shape as a carbon 60 molecule and the classical soccer ball. The shape is made from twelve pentagons and twenty hexagons. 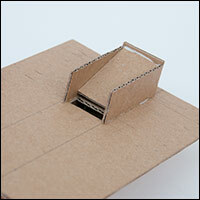 Collect together several sheets of corrugated card. 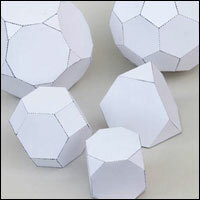 Using the templates, draw out twelve pentagons and twenty hexagons. 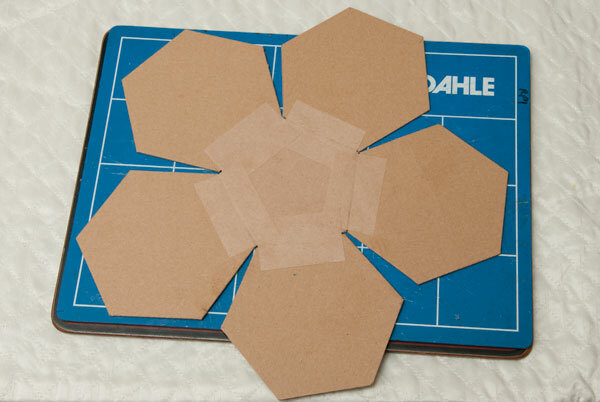 Carefully cut out the pieces using a ruler and sharp knife. 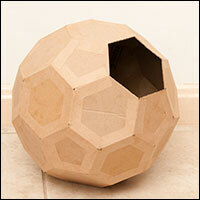 Twenty hexagons, twelve pentagons and a roll of brown paper tape ready to go. 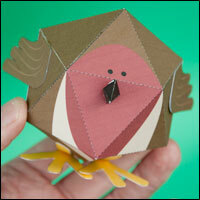 For ease of assemble it is worth spending a little time cutting the paper tape to length. You’ll need ninety strips each the length of one side. 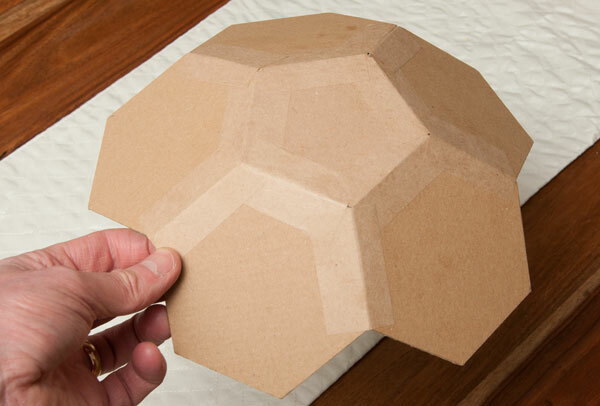 Start with a single pentagon, tape five hexagons round it as shown. 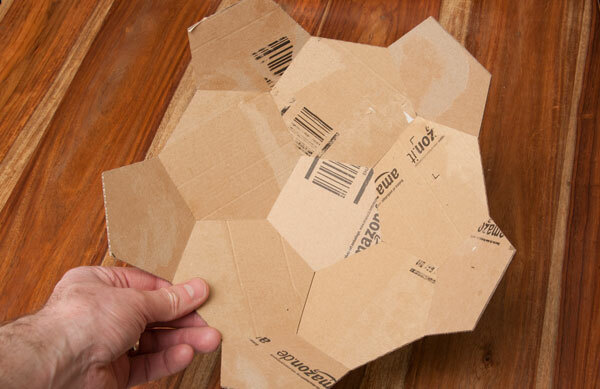 Fold the hexagons up and tape then together. Add five more pentagons between the hexagons. Be as accurate as possible in the alignment of the pieces. Small inaccuracies multiply! 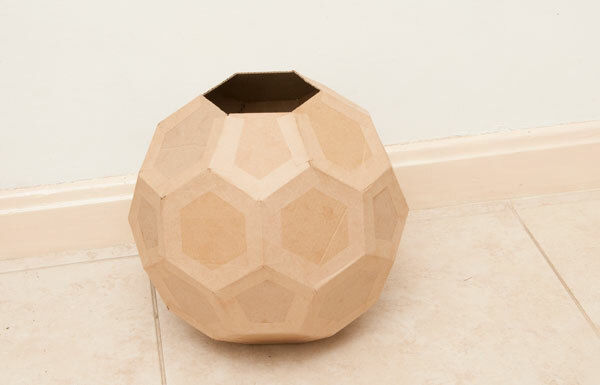 Work your way round the shape adding hexagons and pentagons as appropriate. Each hexagon touches three pentagons on alternate edges. Each pentagon is entirely surrounded by hexagons. Use these rules to help you choose the appropriate shape for each position. I finished off leaving one hexagon off as an access hole. 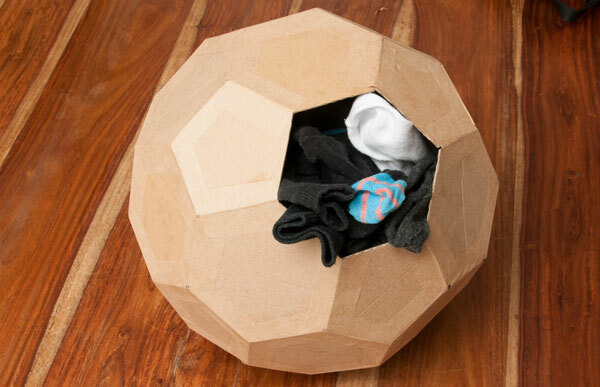 The finished shape makes a fantastic sock orphanage, a stylish litter bin or a play house for a curious kitten. 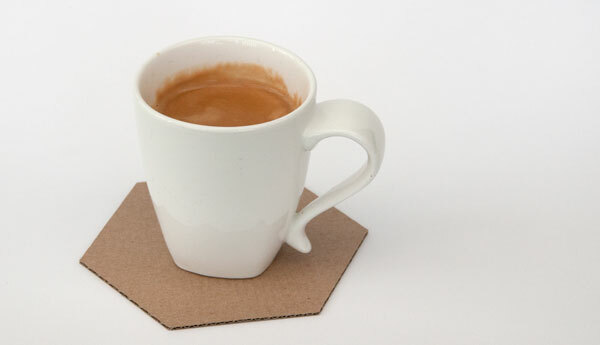 The spare hexagon makes a rather natty coffee mat. "In a closed system the number of single, unpaired socks always increases." "Clutter expands to fill the available space." Ah the old space time conundrum. Objects occupy space for a period of time. Space and time are connected but you can't expand both. The solution is to use compression, but seeing as you don't have access to a black hole to produce super dense matter, carefully stack your objects and slowly close the door to minimise distortions. ..and slowly close the door to minimise distortions…and then relax in time, which as already said, can't be expanded either. I had heard that it was WORK that expands to fill the available space and time. Hi Rob, This is really a terrific design! Modern, stylish, and functional. Love ette! The storage is an original and good idea. In the “www.” I found a pattern for a "Truncated icosahedron". With some color of "PSE" (Adobe Photo Shop Elements), and printed on a sheet of A4. Stuck together you get a mini-football in one piece.